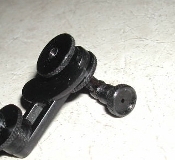 This is a replacement aperture for the RARE #3 Mossberg receiver sight. This sight used two apertures...the spare aperture was screwed into the thumb nut. We make two sizes. 050 and .080. Please indicate your size preference at checkout. We will also be making spare replacement parts for this sight so email if you need parts.